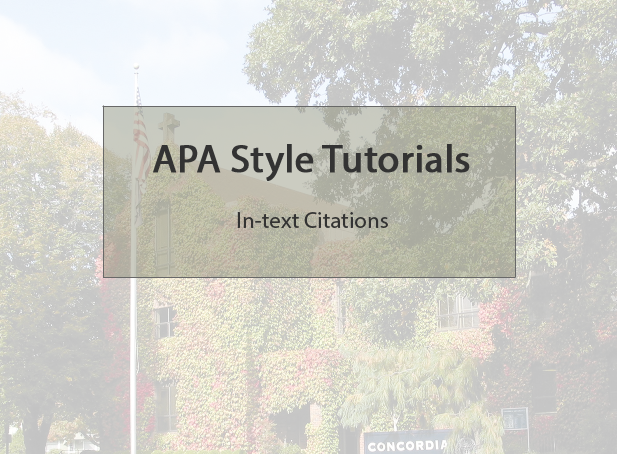 APA style requires that you cite the author and publication year of a reference in the text of your paper. One or both of these elements may be in parentheses. Direct quotations also require the page number. If both author and year are in the text, no additional information is needed. The full information for the source will follow in the reference list at the end of the paper. Here are some examples. More detailed examples are in the handout to the right. Paraphrase There was no relationship (Nkumbe, 2016). Quote She stated, "...." (Lopez, 2015, p. 15). Quote, author in text Lopez (2015) states that, "....." (p. 15). Quote from a website (use paragraph numbers) She stated, "...." (Lopez, 2014, para. 5). Two authors Nothing was proven (Nkumbe & Lopez, 2016). Quote that spans more than one page She stated, "....." (Lopez, 2015, pp. 15-16). Smith (1979) found that linguists were surprised by an ape’s ability to use sign language (as cited in Patterson & Linden, 1981). In this example, a student read the Patterson and Linden source (secondary source), which cited the Smith 1979 source (original source). Since sources are only listed in the references list when they have both been read and cited in a paper, only Patterson and Linden is included in the references list.